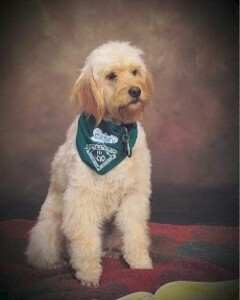 I am thrilled with my one-year old male pup named “Casey” from Wine Country Goldendoodles. I feel that I didn’t just pay for the puppy, but for the hours upon hours the breeders spent before, during and after the puppy left the litter. The breeders take their work very seriously, and do it with a great deal of love and sense of service. This is my experience with Wine Country Goldendoodles: I was looking for a dog who was not huge, shed very little or not at all, was easy to train and was gentle and kind to people of all ages. I was also looking for a dog for a specific purpose: to be a facilitated service dog for my brother, who lives with a brain injury, and/or a therapy dog for my community service. I didn’t go out in search of a goldendoodle. I was open to going to shelters and to AKC breeders. I had had two dogs before, but decided to hire a professional trainer. I chose a trainer who said she’d had 30 years of experience to assist me in finding the “right” dog, so that I could decrease the chance of finding myself bonded to a dog that had no aptitude for the work I wanted to do. At Wine Country Goldendoodles, the trainer met the family who bred Casey. She emailed them that she was impressed by the care they took in breeding and socializing the puppies, and readying them for their new homes. On our first visit the trainer temperament tested the litter. She declared that there wasn’t one puppy in Casey’s litter who wouldn’t make a wonderful companion, but she chose Casey because of his balanced temperament and his potential to become a service dog. I thought, Canine Companions for Independence breeds Labradors and Golden Retrievers to create a mix for the needs of their disabled population, and man has been interbreeding animals for specific purposes as long as recorded history, Why should I not purchase a dog from dedicated breeders who are creating the type of dog I need? The trainer encouraged me to stop my search because, in her experience, goldendoodles were easy to train and had wonderful dispositions. She assured me that we had indeed met our match. The breeders ask for references so they know the puppies go to a good home. They give you beautifully prepared information on potty training and positive training in the puppy’s first months. They ask that you sign a contract so that you return the puppy to them should it not work out. They check in by email to stay in touch. They are serious about wanting you to have a happy, healthy and well-adjusted dog. In the following months I have found that everything the trainer said has come true — and more. Wine Country Goldendoodle’s Casey never ceases to amaze me: Last week, two days before his first birthday, he became certified for canine-assisted therapy in hospitals, or working with me to help kids improve reading skills in local elementary schools. During his first year he passed four Humane Society trainings, which he just loved, because Casey loves to learn. It takes him about 3-4 tries to learn just about anything. In the past few weeks he has learned to “retrieve” the newspaper from the mailbox 4/10 of a mile away – and drops it at my 85 year-old mother’s feet. He loves agility jumps and tunnels and loves to play fetch. Casey is fun, sensitive, interested in the world and kind to children, other dogs, and is friendly to everyone he meets. His Benji -looking face attracts people everywhere we go. People stop me to ask what type of dog he is and some ask where they might find one like him. That’s not to say that anyone should run to Wine Country Goldendoodles and purchase a puppy. Casey has reminded me that all dogs are a huge responsibility and owning one takes an enormous commitment of time. A goldendoodle like Casey has taken more time than other dogs I have owned because he is high energy, intelligent and mischievous. As the trainer warned, he needs two high-energy, burn-out sessions a day, then he happily curls up at your feet. On allergies: Yesterday on our walk a man stopped to say that he was caring for Jayber, a half-brother of Casey. He was doing this because his wife was testing out whether she might be allergic to the breed. He said she was “allergic to everything, but had no allergies to this Wine Country goldendoodle.” My experience (as a person who is very allergic) is that certain dogs can be hypo-allergenic, but breeders need to know allergies remain case specific: any dog can cause allergies in anyone, some cause fewer allergies than others. A goldendoodle falls into this category. In sum, It didn’t surprise me at all when I noticed that the trainer had redesigned her cards to put a goldendoodle on its face. I’d like to put a photo of Casey on my business card too, because day-by-day Casey and I are growing to become very much a human-canine service team. Oops! Gotta go. Casey’s nose is in my arm. He wants to play ball!-Anne P.